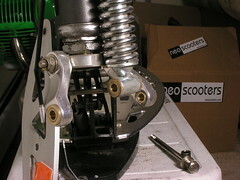 The Puzey cam link suspension system is a simple, sturdy extension to the cam forks seen on many Bladez, Tanaka and Evo scooters. It manages to absorb shock through the use of opposable links and an oil filled single [shock absorber]. 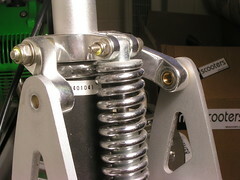 This suspension came stock on Evo's 2x scooter and can be easily adapted to fit on Evo's 2, Tanaka's Paverunners and Bladez Mobys. Although this system is extremely sturdy and resilient, it relies on 10 bushings to maintain movement and because of eventual oxidization and contamination, will require cleaning and re-lubrication. You can tell if this is necessary on your scooter if hear squeaking or feel any stickiness when depressing your suspension. This guide will show you how to disassemble your cam link suspension system and re-lubricate its bushings. 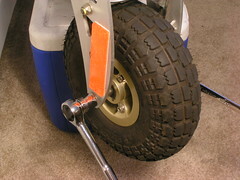 The front wheel itself is the first connection holding the suspension together. Remove the bolt holding it in place and keep careful mind of the spacers. 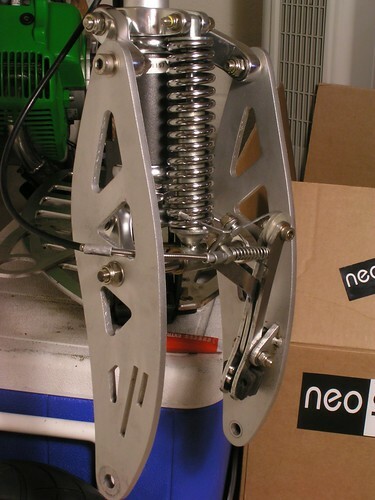 The smaller spacer will go on the brake side of the wheel while the larger on occupies the other side. Now is a great time to replace your wheel bearings if they aren't spinning smoothly. The suspension bolts should be quite tightly fastened. Use the allen and 13mm wrench to remove the bolts holding the cams in place. After you remove the outside bolts, you should be able to remove 6 bushings (4 from the links and 2 from the bottom of the shock). 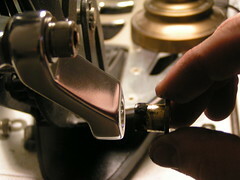 If the oxidation is bad, you may not be able to easily push out some of the bushings. Don't worry about that just yet. Use the hex key and 13mm wrench again to remove the bolt from the bottom of the support pole. The aluminum support donut should fall freely away from the support shaft along with the links and bushings. Finally, remove the top links from the support pole. The bolt that holds these in place is often very tight and may need some coercion to be freed. If this is the case, try to spin it and pull at the same time. The threads of the bolt should catch enough to help you to pull the bolt out. Now that you have all of the links free, remove all of the bushings. They should be easy to remove with your fingers, but if not you should be able to push them out with a bolt and the strength of your hands. Use the brake cleaner to remove all of the old lubrication and dirt. You should be able to rub away most of the grime with a paper towel if you let everything soak for an hour. Hopefully, you will be left with shiny bronze, but if not, don't stress yet. The oxidation may not be cause for concern. Don't forget to thoroughly clean the inside of the links as well. The bushings should be able to fit into the cam links and rotate inside of them easily even without lubrication on them. 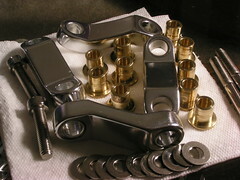 If a bushing will not easily go back into its link, you may have to remove some oxidation from the link or the bushing. 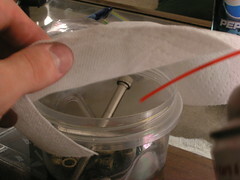 Use the sand paper to lightly remove the oxidation from around the bushing. Warning: The bushings are measured to an exact tolerance inside the links. If you remove too much material you could ruin the bushing. Don't try to remove all of the oxidation. Only remove enough to be able to fit the bushing easily into place. For these bushings, I suggest using only dry lubrications since they will minimize the attraction of dirt. 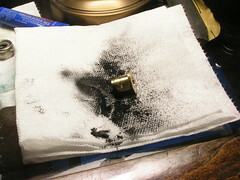 For this example, I am using a combination of a drying chain lubricant3 and graphite power. 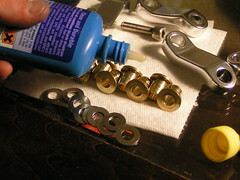 Apply a small amount of the drying lubricant to the bushings themselves and inside the links the bushings will fit into. This will help the graphite stick temporarily. Let things dry for 15-20 minutes. You want to apply the most liberal amount of graphite powder possible. The more you can get to actually go into the join, the better. The drying lubricant should help the graphite to stick to the bushing until you replace it in its link. Replace each bushing, one at a time, by rolling it in graphite. When reassembling your suspension setup take careful care to make sure that you put the washers back where they were when you took everything apart. Was you replace the bushings, a lot of graphite should fall away. Try to keep as much as you can on the bushing so that it makes it into the links. 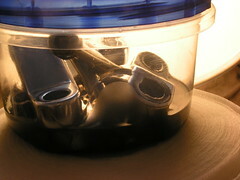 Use the locktite on all of the nuts as you replace them as well to make sure everything holds together. Make sure to give the suspension a few test squishes to ensure everything is operating smoothly. 2. This will only be necessary if oxidation has occurred on your bushings.